Tesla tries to take it to the top. With winter now behind us (mostly...sorry, Northeastern states), drag racing season is now in effect, and the Tesla Racing Channel is out in full force. 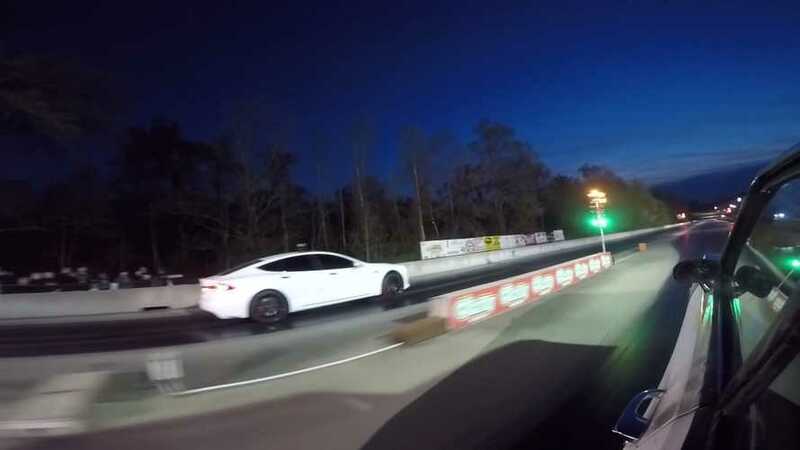 A newly published video has the team's Tesla Model S P100D — once fully stripped out, but now put back together — at 1/8th-mile Greer Dragway in Spartanburg County, South Carolina. There it competed in the "Top 10 Street Car List Race," which you can check out right below. Now, we can't say we fully understand all the ins and outs of list races, but apparently racers have a chance to move up through the top 10 by taking on the the car ahead of them on the list. The video shows our protagonist starting out at 7th on the list, matched up against a sleeper Chevy Nova, resplendent in its mismatched body panels and grey primer. After putting it squarely away, the Tesla moves into number six position. Next up is a nitrous popping Corvette Z06, holder of the fifth position. Now, this is a car that even the Model X P100D can smoke in the quarter mile sans nitrous. But, despite the 1/8th-mile runway playing to the battery-powered racer's advantage, the Chevrolet puts our guy in the rear view and holds onto his spot. A third contest sees the TRC defending its newly-acquired sixth position against a fox body Ford Mustang, which is also leaning on nitrous for added horsepower. The Pony car doesn't quite have the legs to counter the Tesla's smooth launch and our guy holds on to his place...until next weekend, at least. Unfortunately, the video ends in a bit of illegal street racing — on a bridge, no less. It looks like our guy loses to another fox body Mustang, but really, if it's not on a track, we don't care.